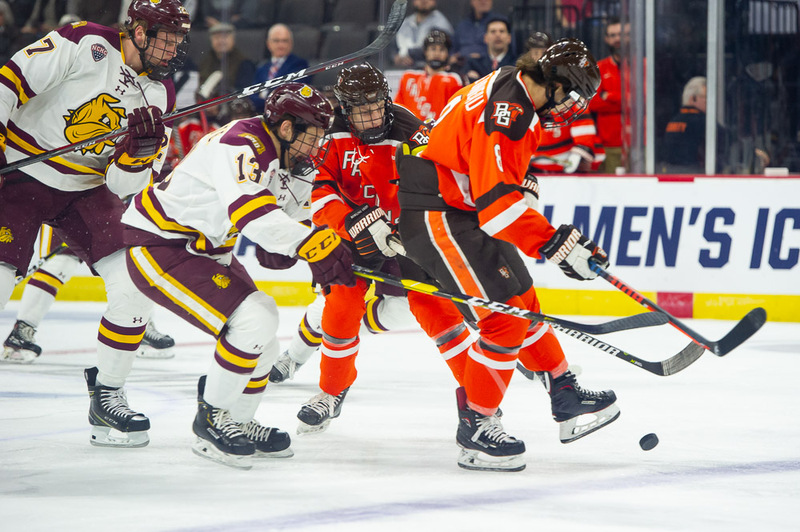 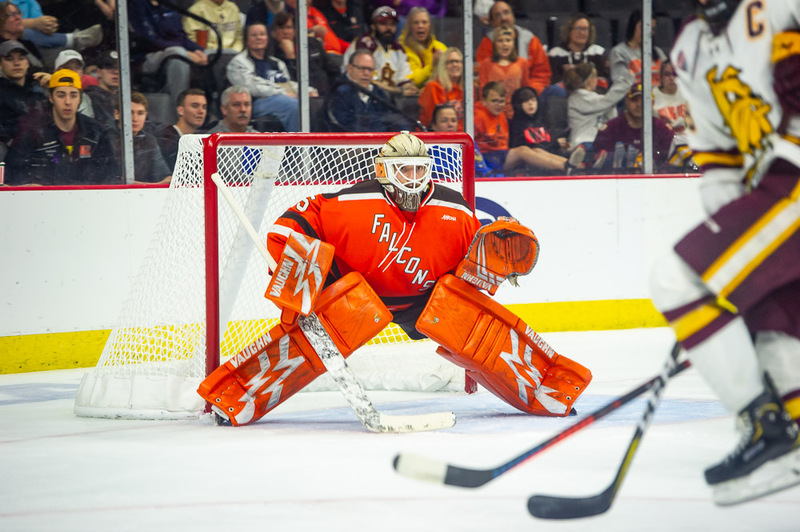 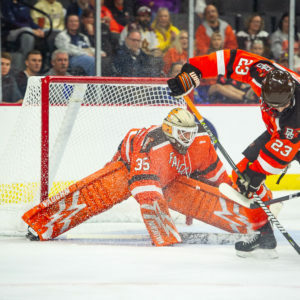 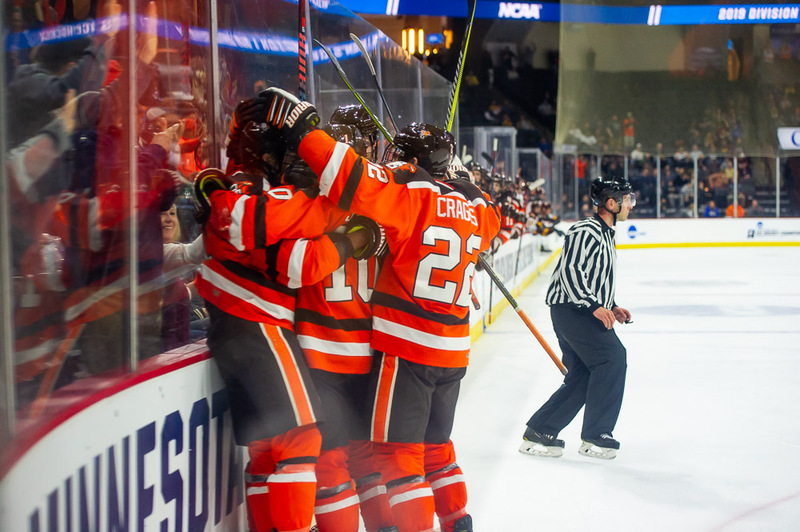 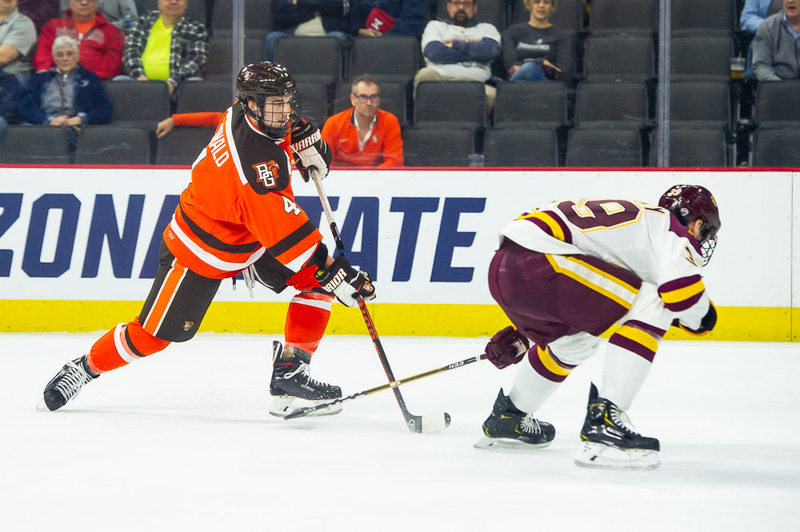 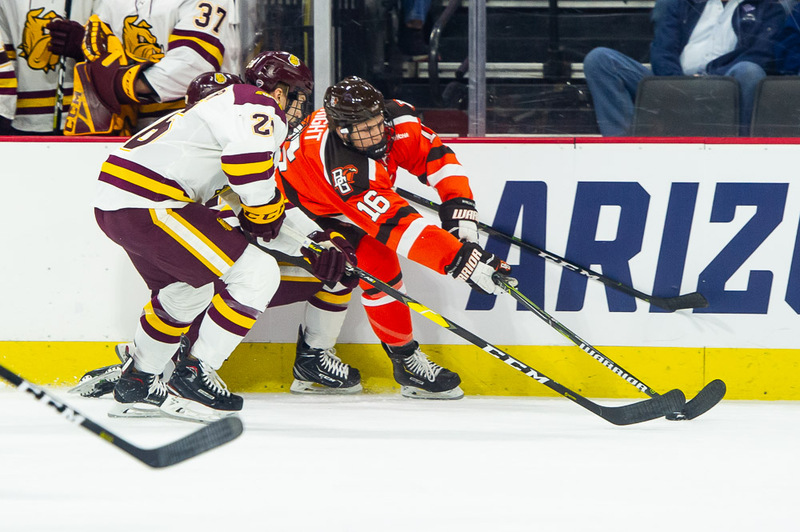 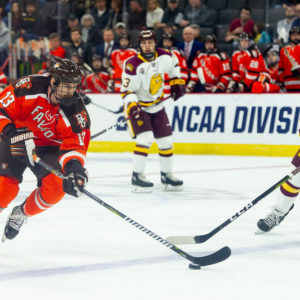 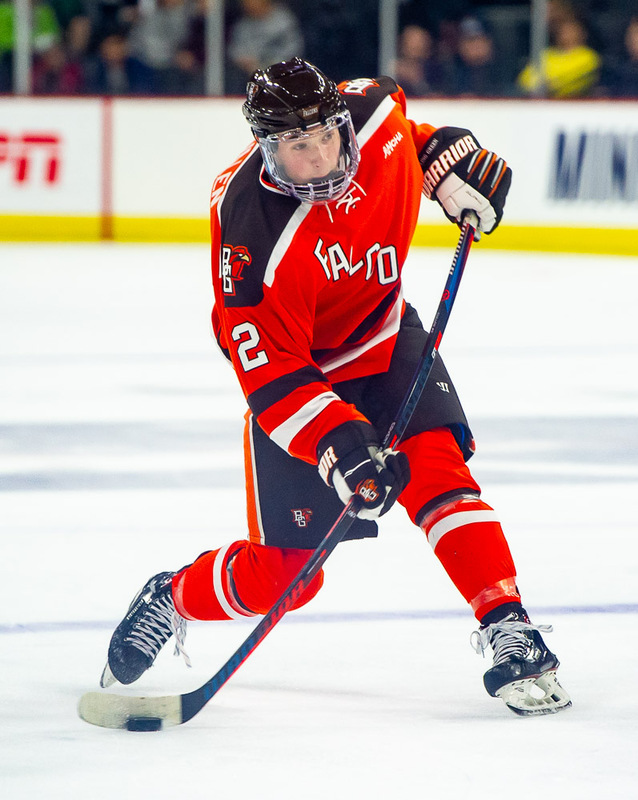 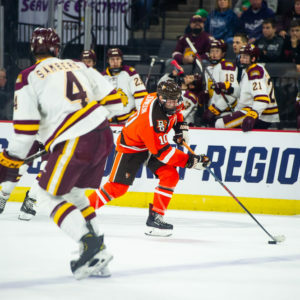 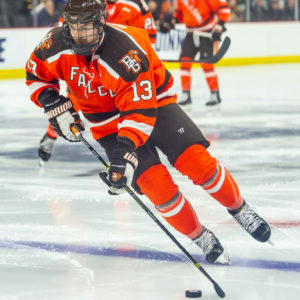 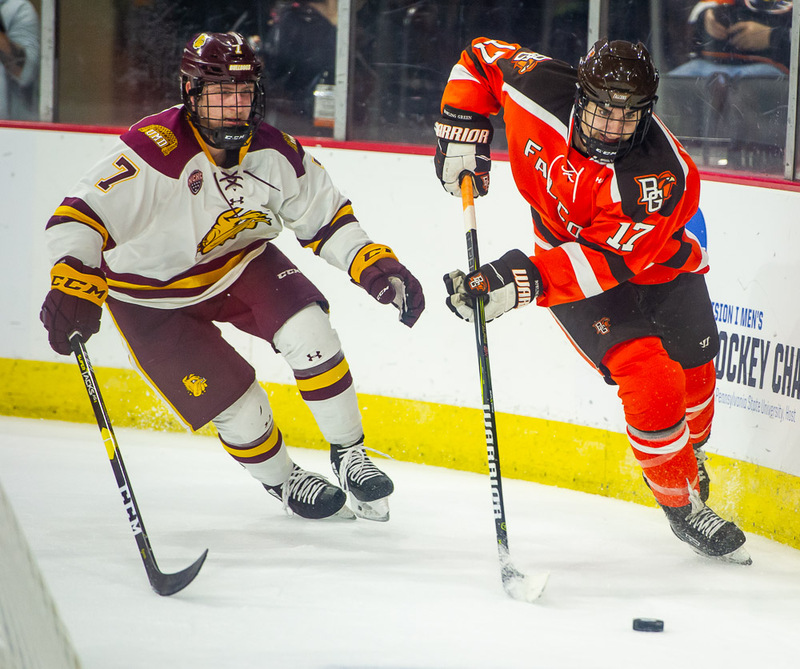 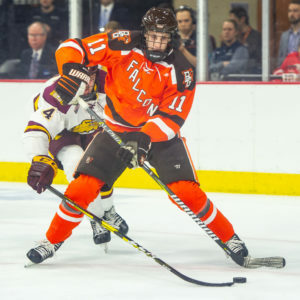 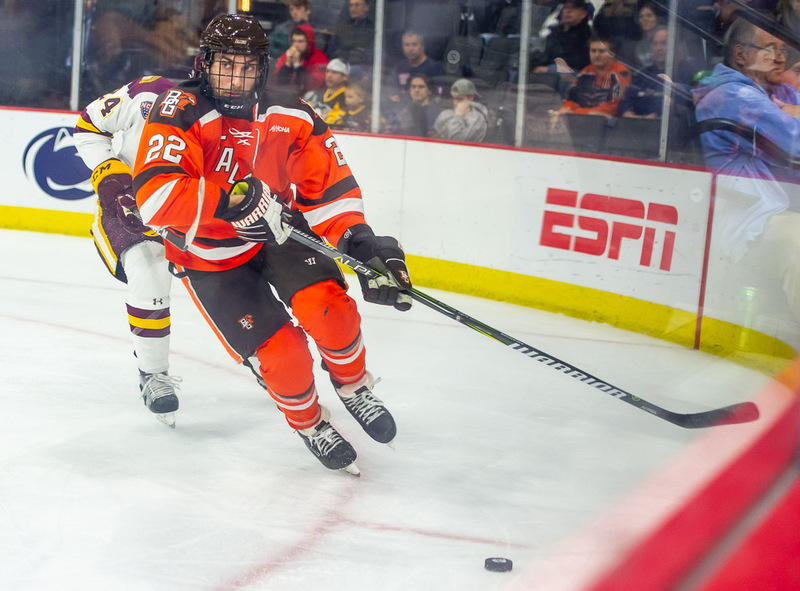 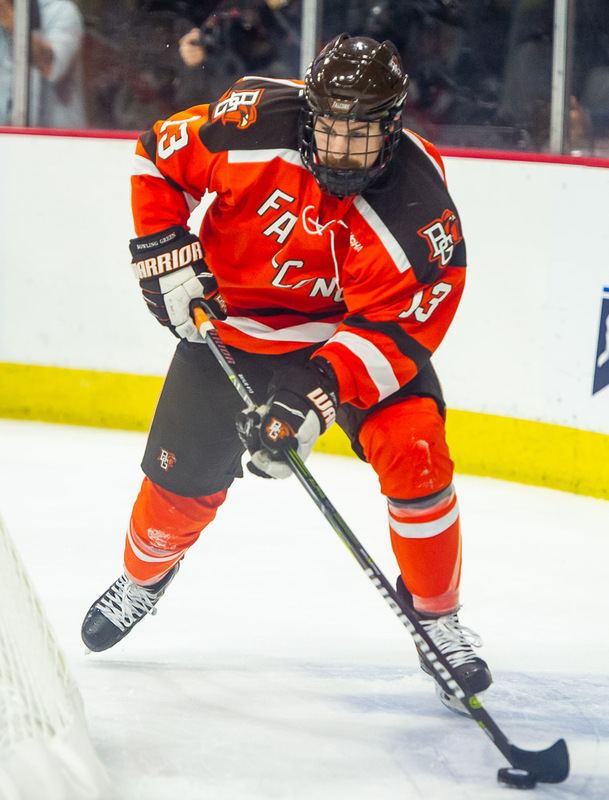 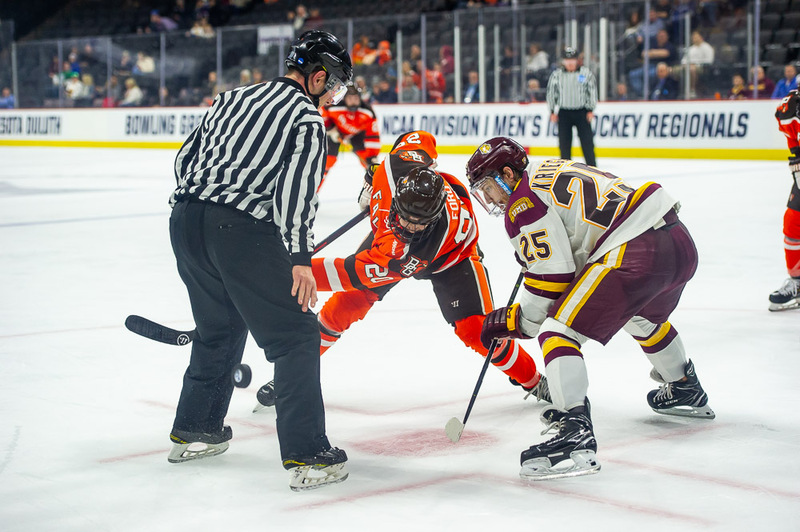 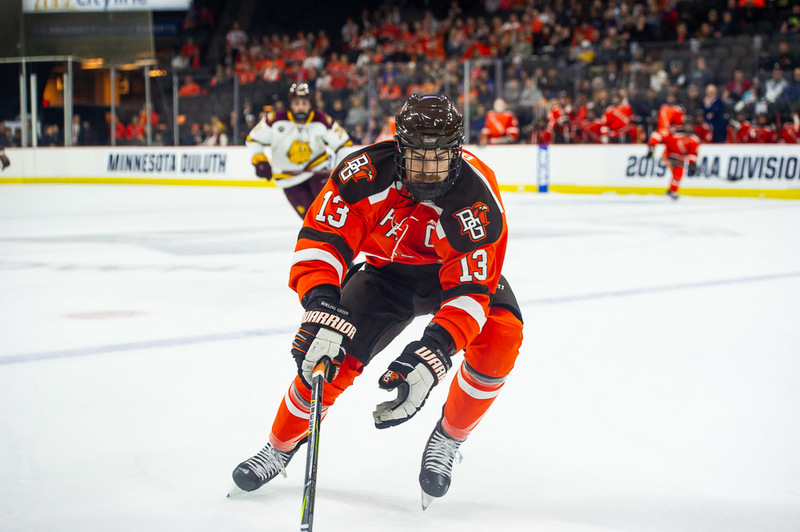 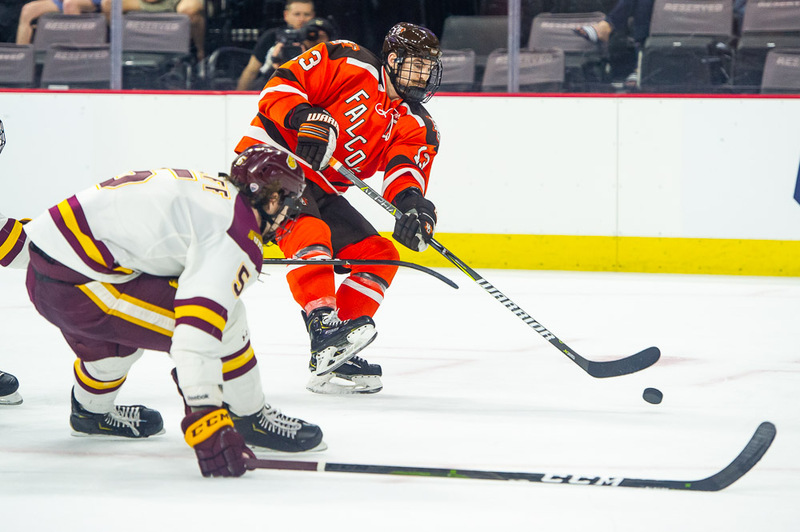 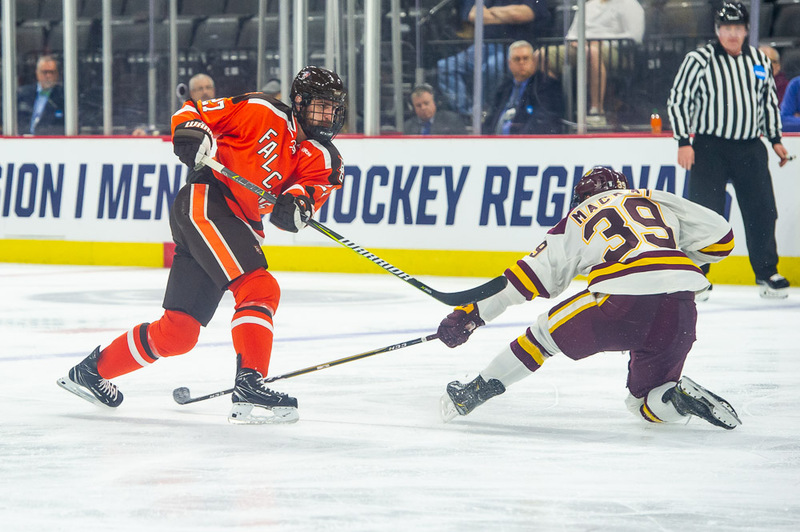 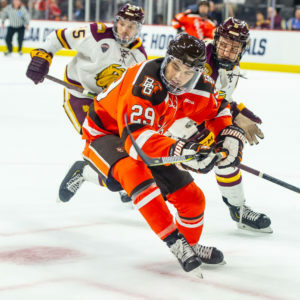 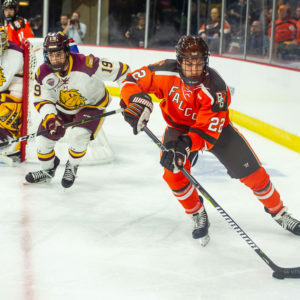 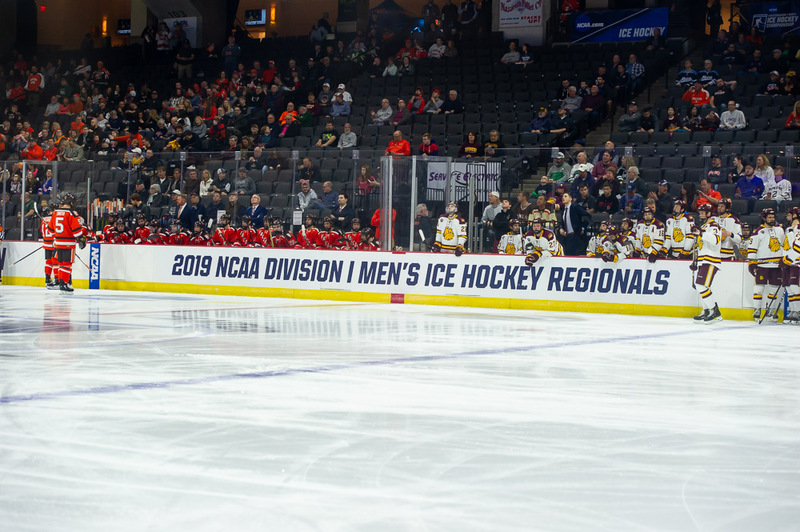 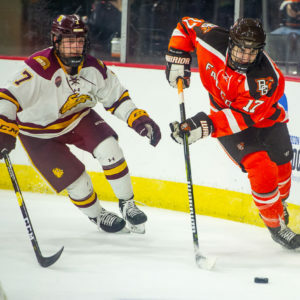 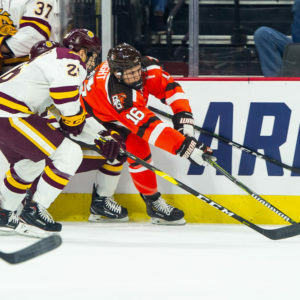 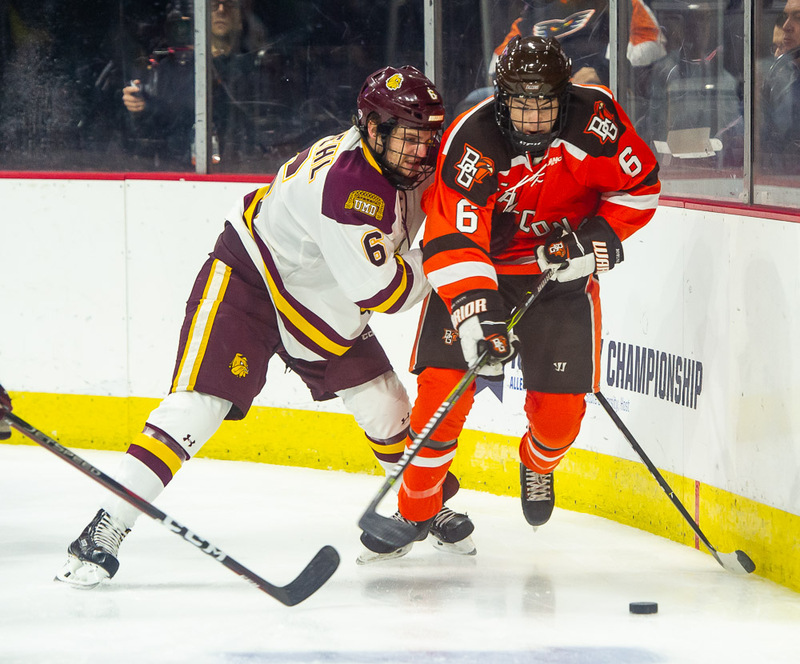 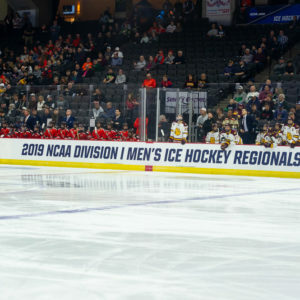 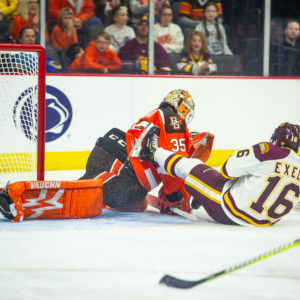 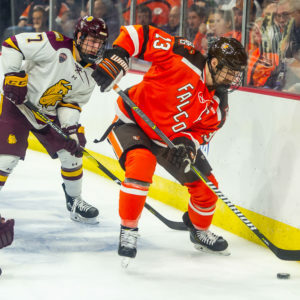 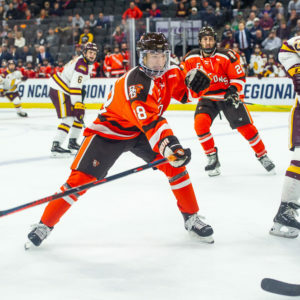 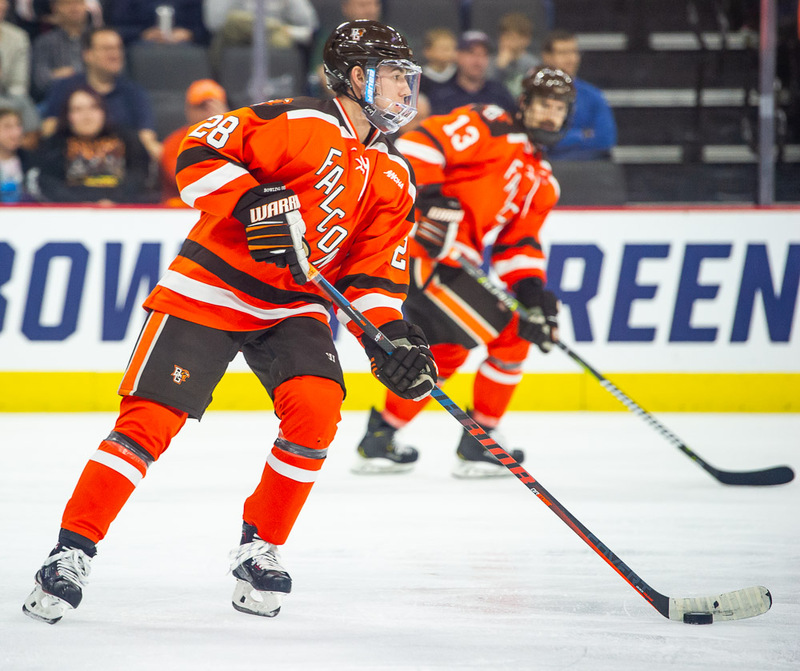 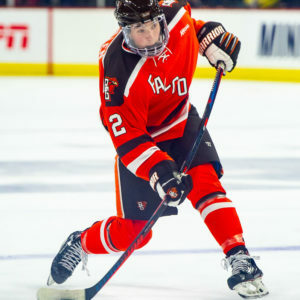 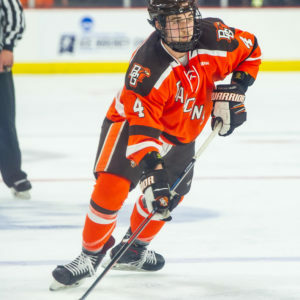 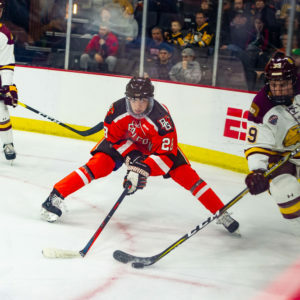 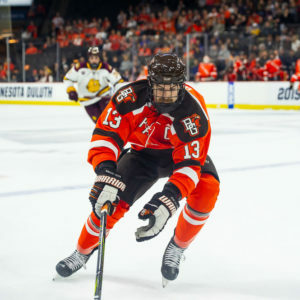 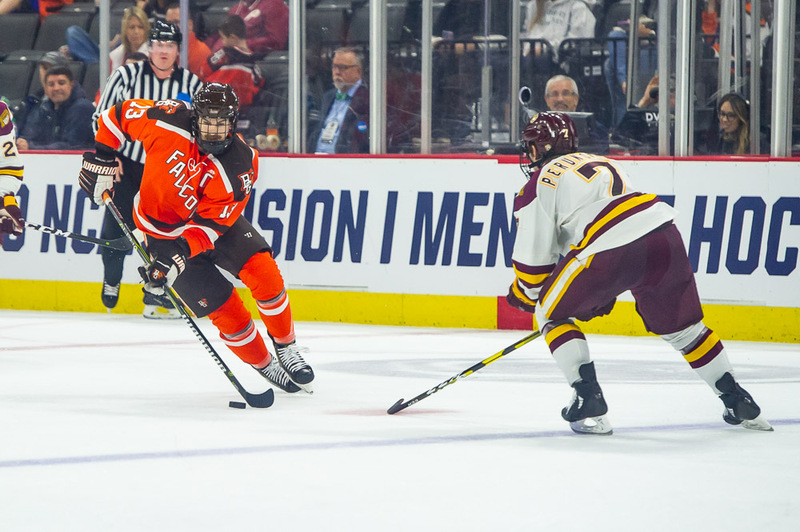 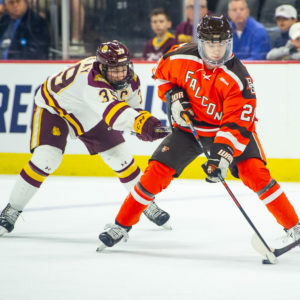 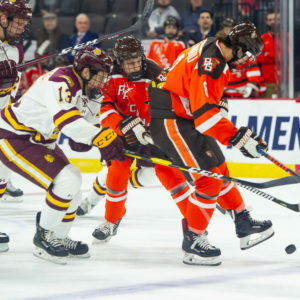 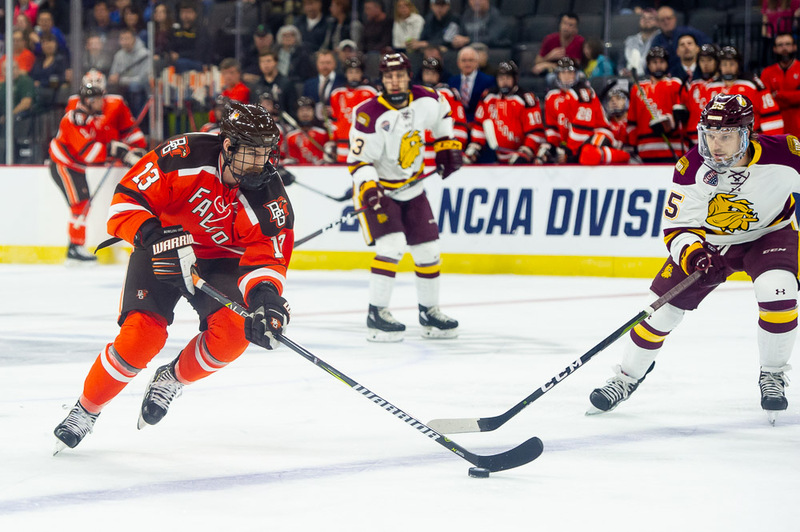 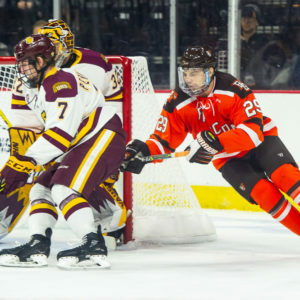 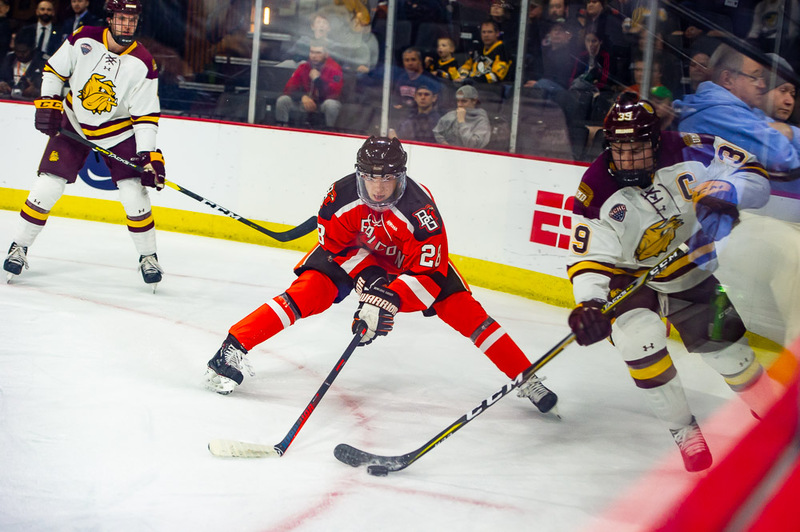 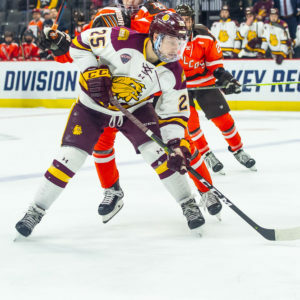 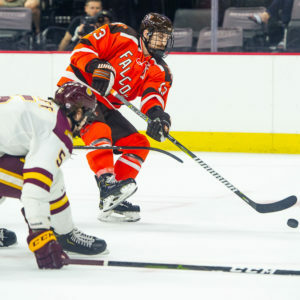 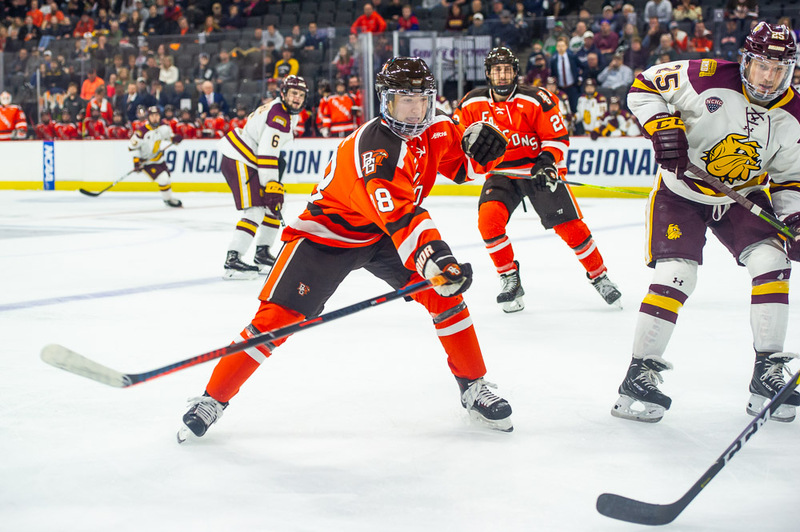 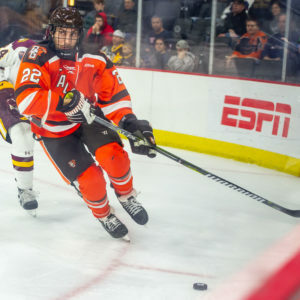 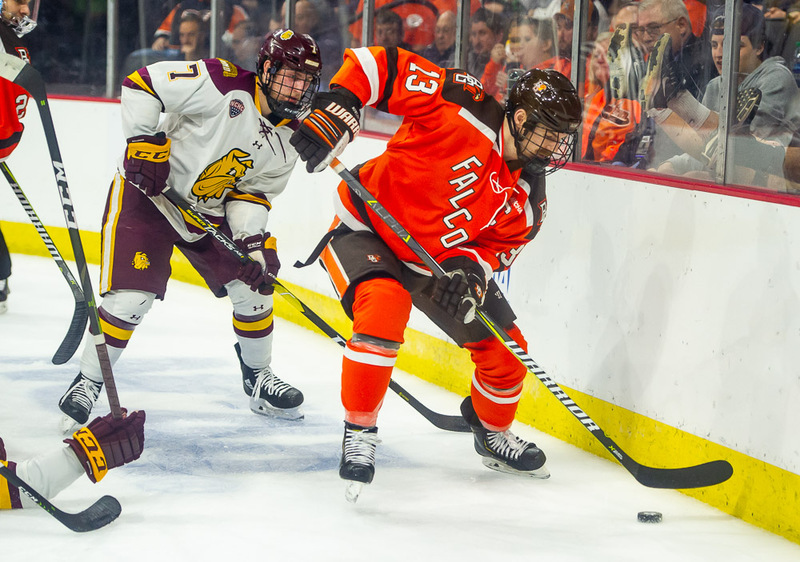 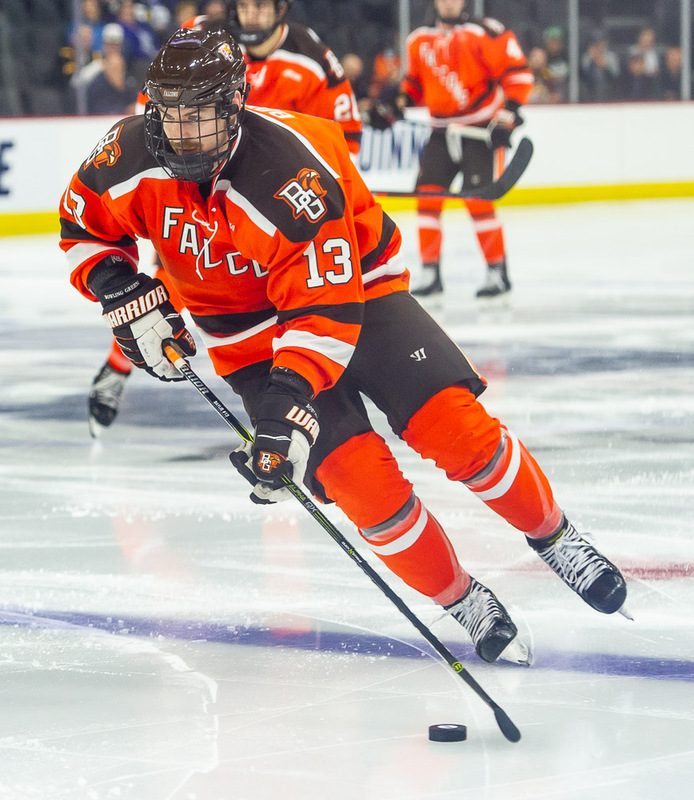 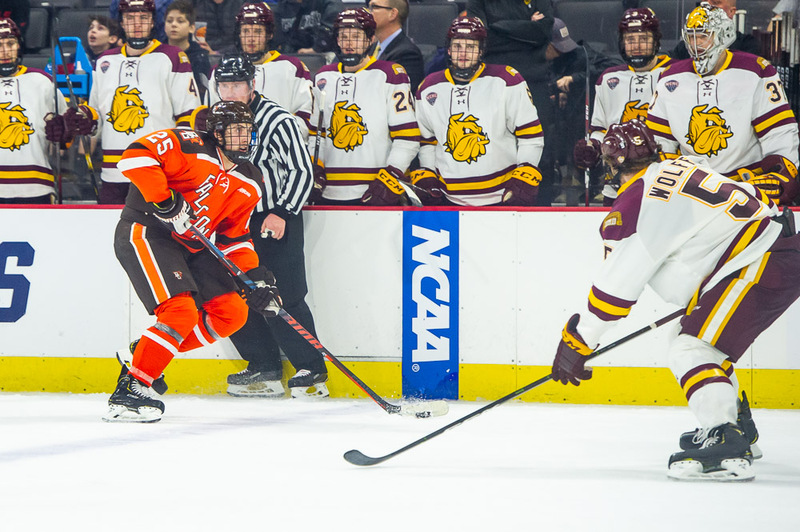 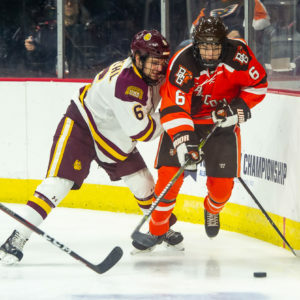 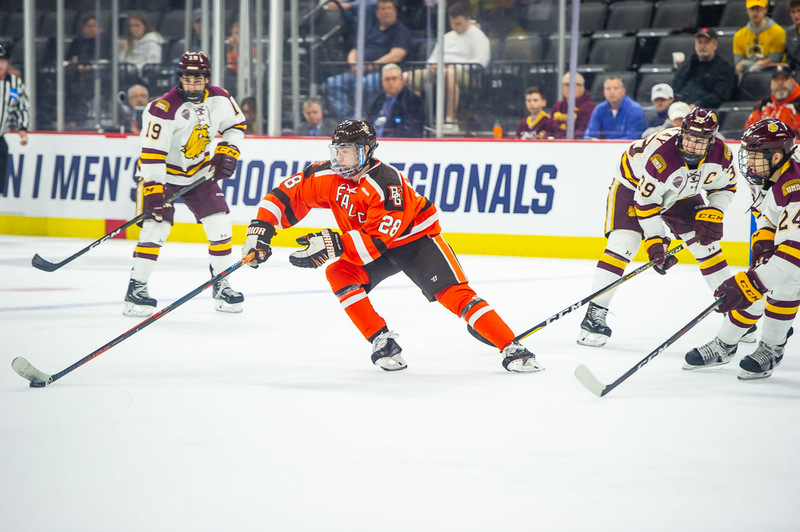 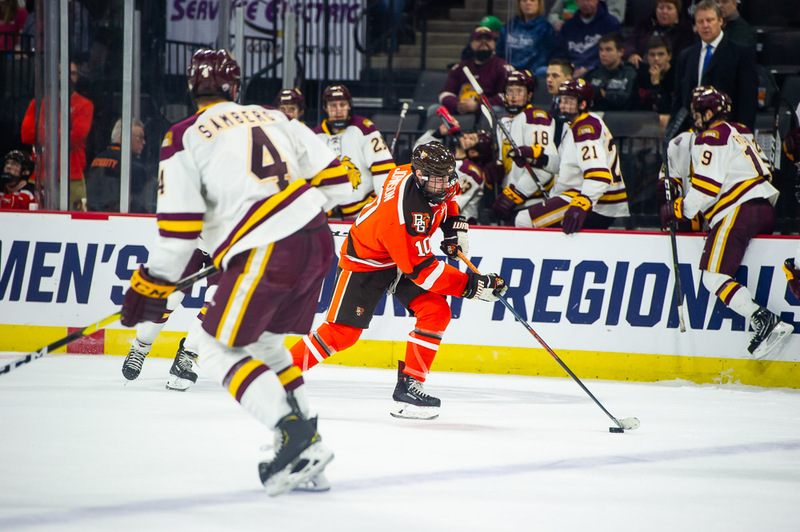 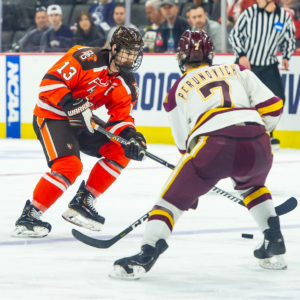 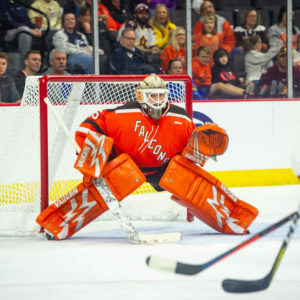 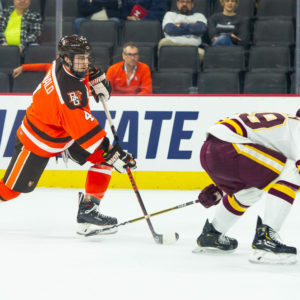 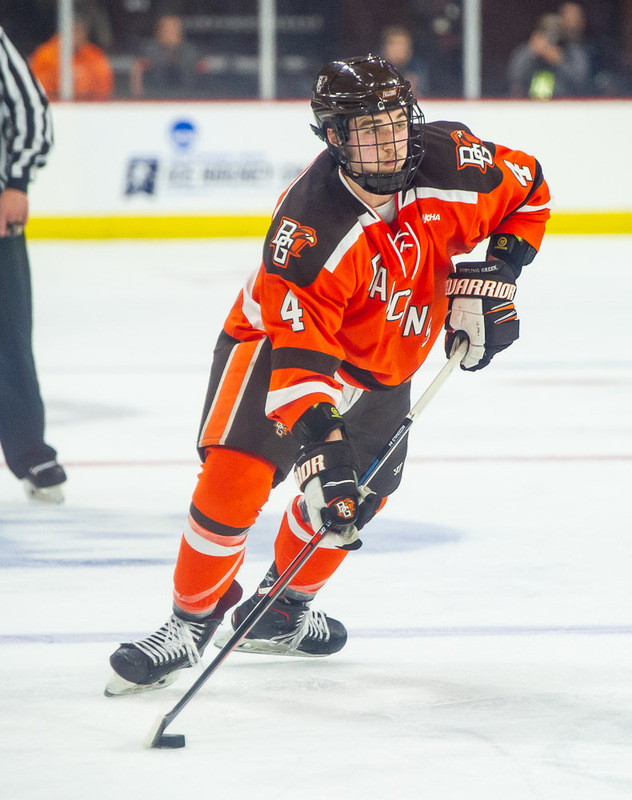 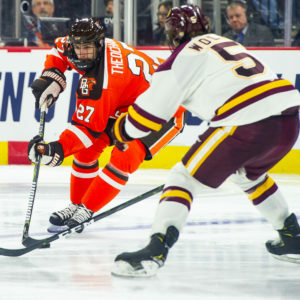 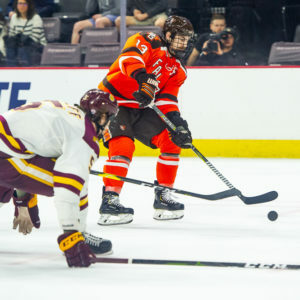 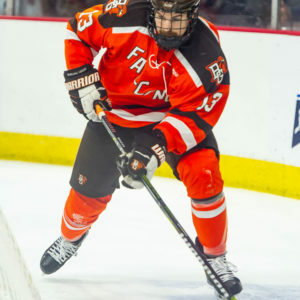 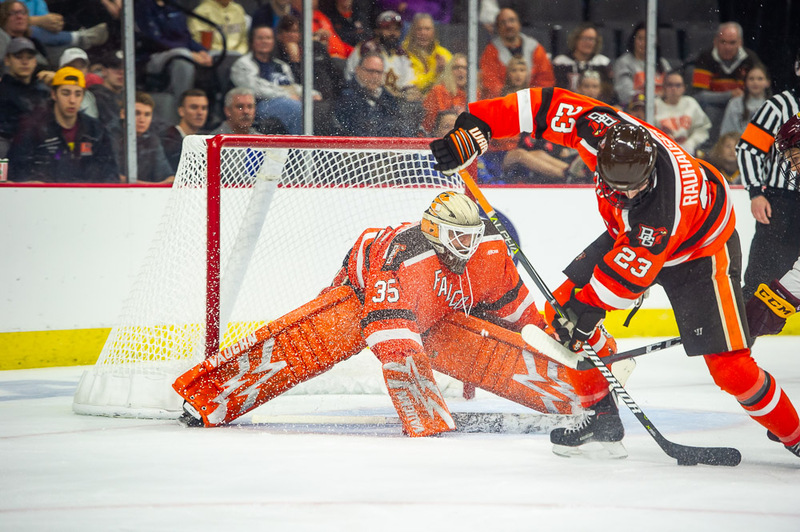 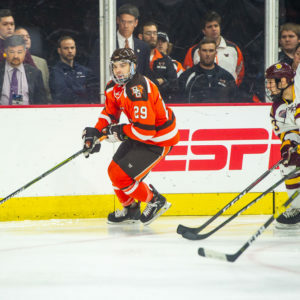 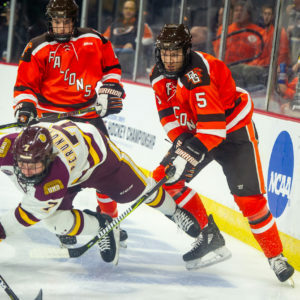 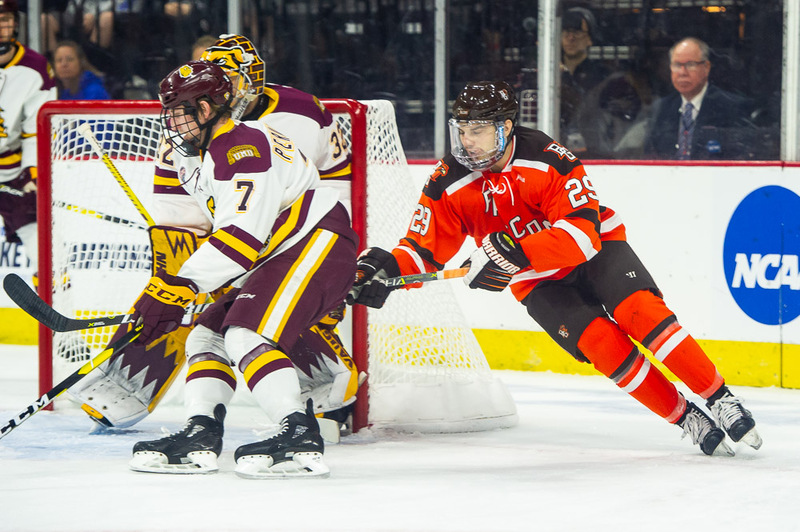 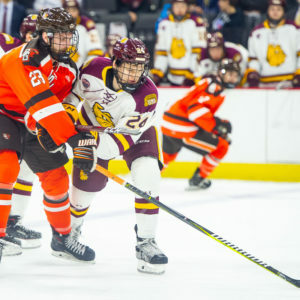 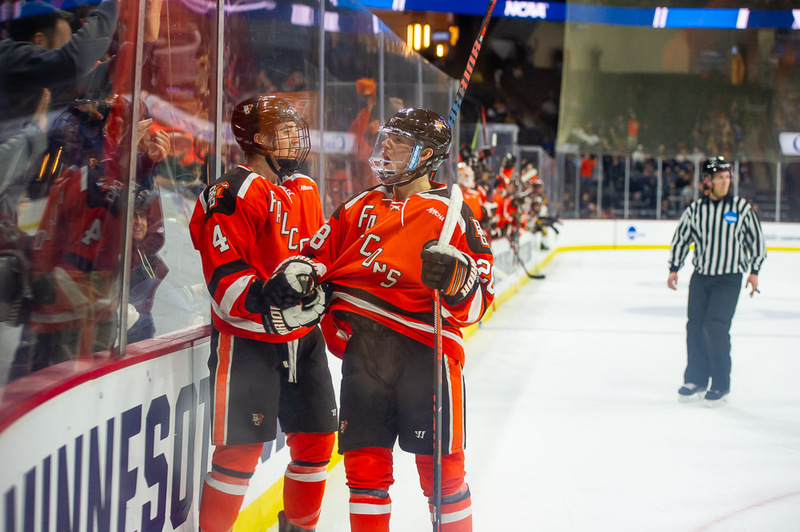 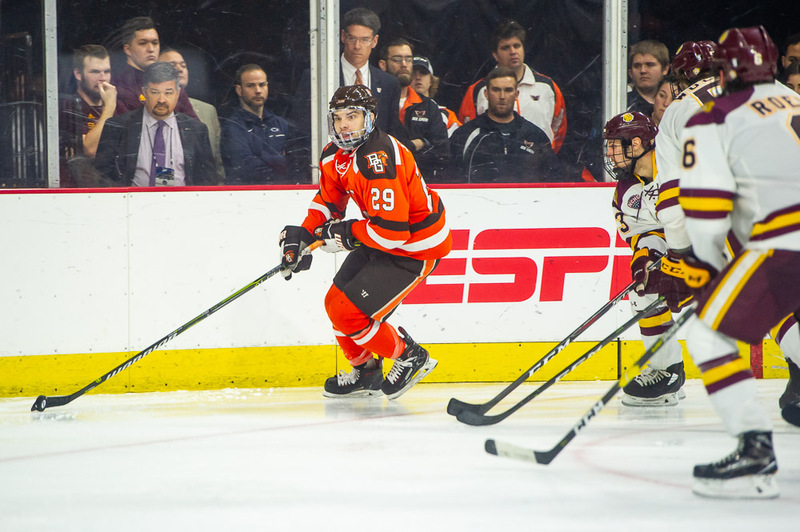 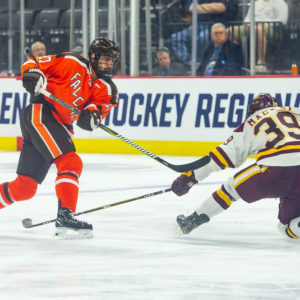 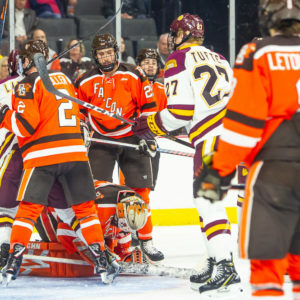 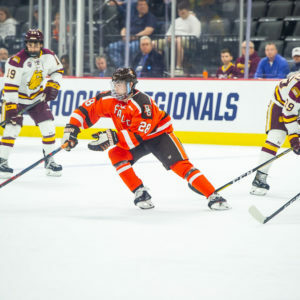 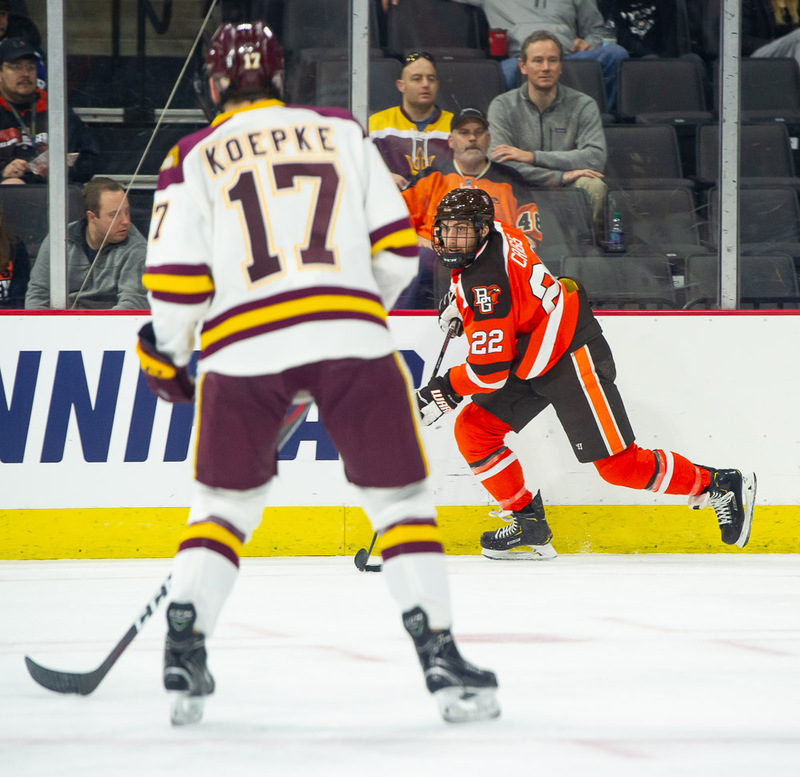 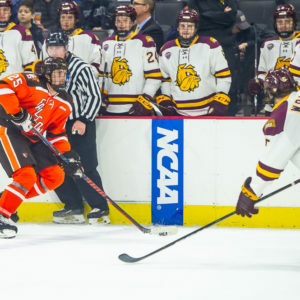 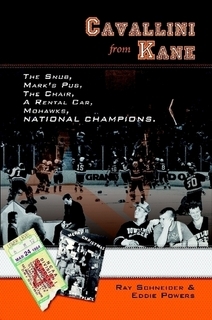 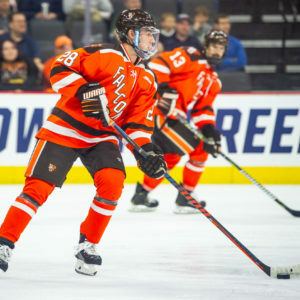 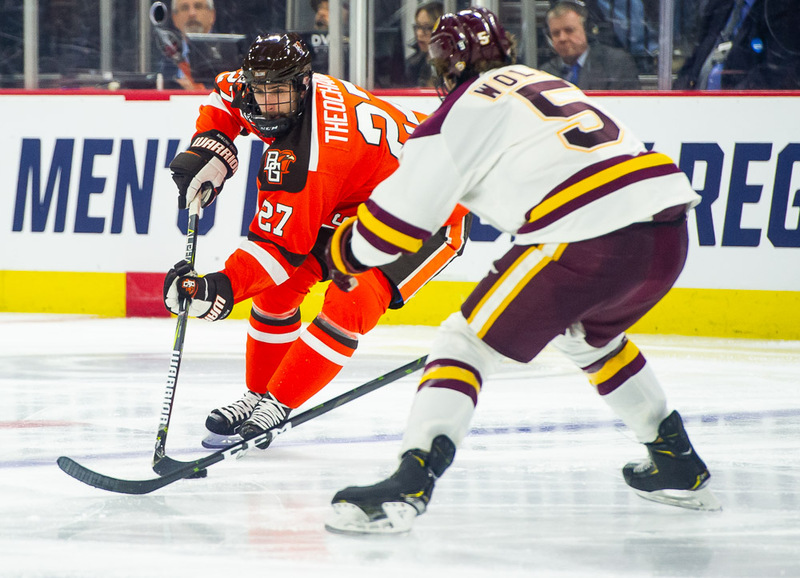 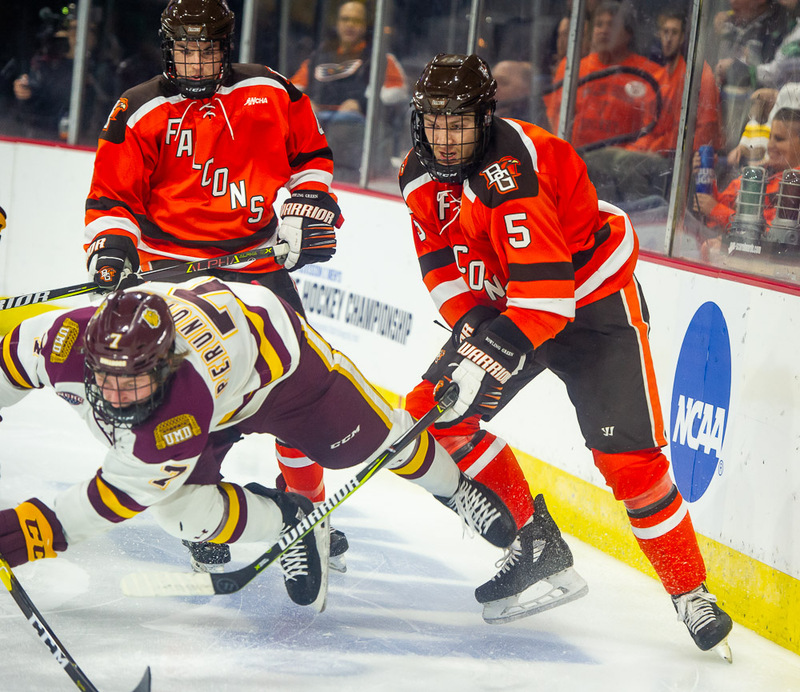 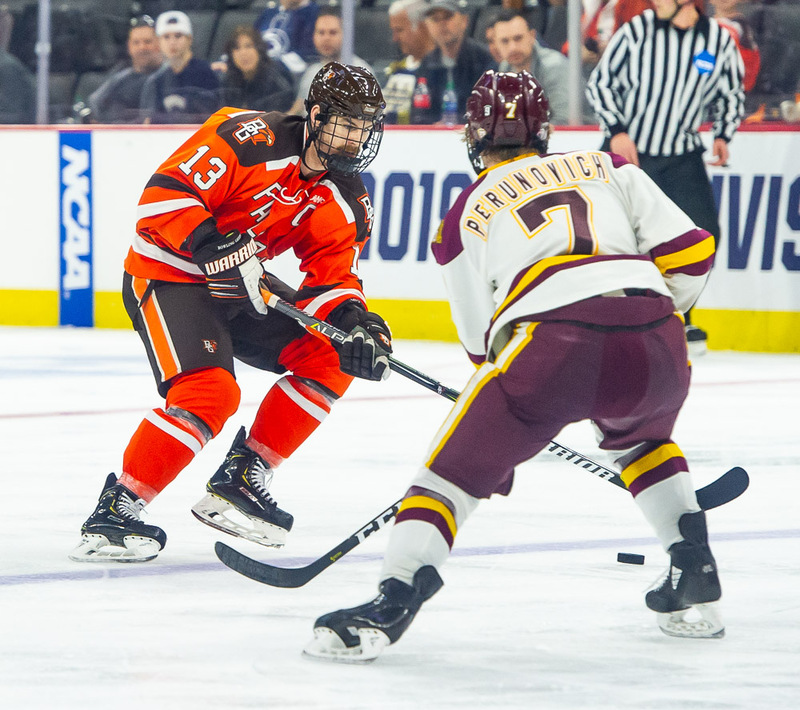 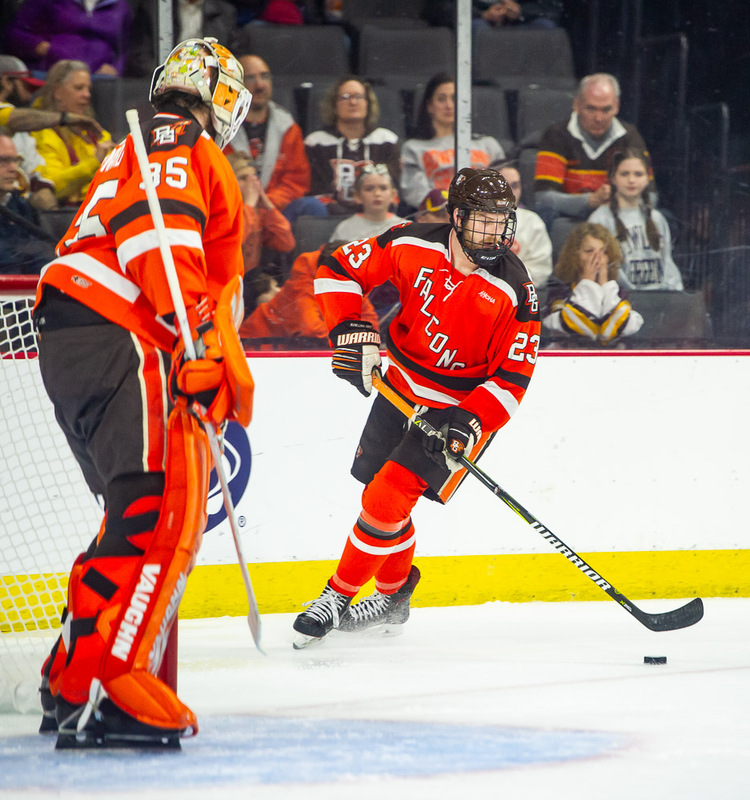 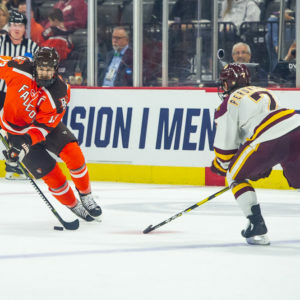 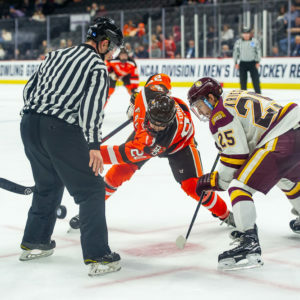 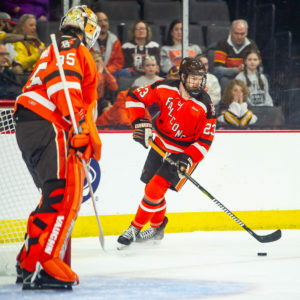 Allentown, PA – The 15th-ranked Falcons gave defending National Champion Minnesota Duluth (#2) all they could handle Saturday in the Midwest regional semifinal of the NCAA Tournament. 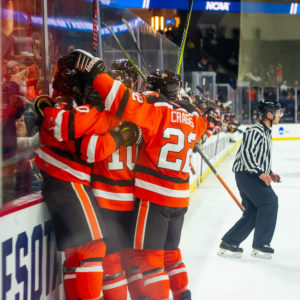 But, a late tying goal in the third period and an overtime heartbreaker ended the Falcons 2018-2019 campaign. 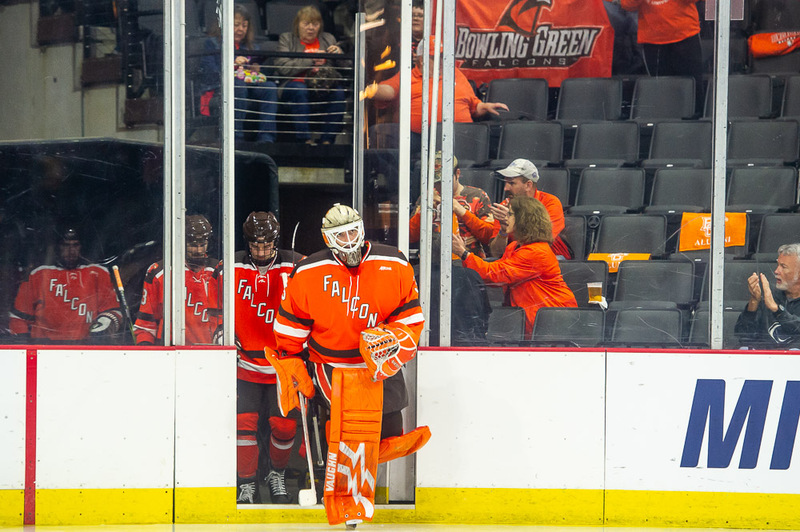 Ryan Bednard was brilliant in net for the Falcons, stopping 41 of 43 shots faced. 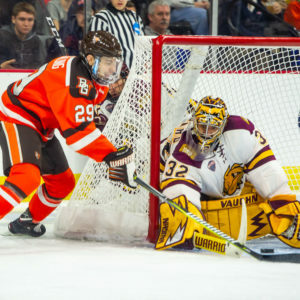 Hunter Shepard had 30 saves on 31 chances. 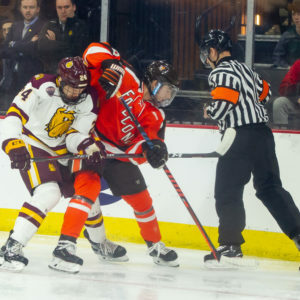 Neither team found the net in the opening period as the teams skated to a stalemate. 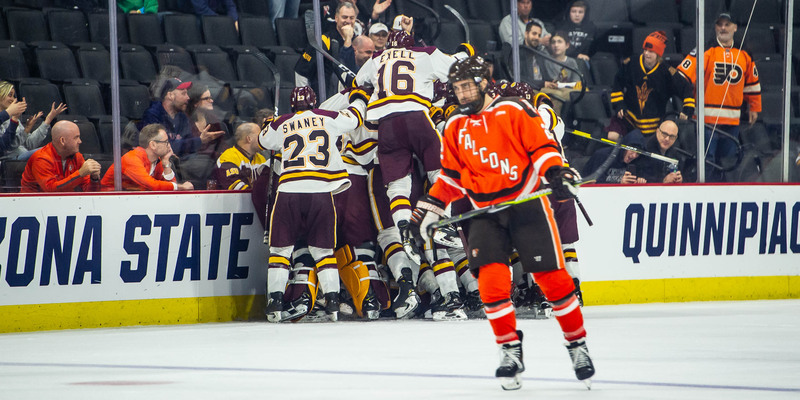 Minnesota Duluth had 11 shots on net while Bowling Green had 10. 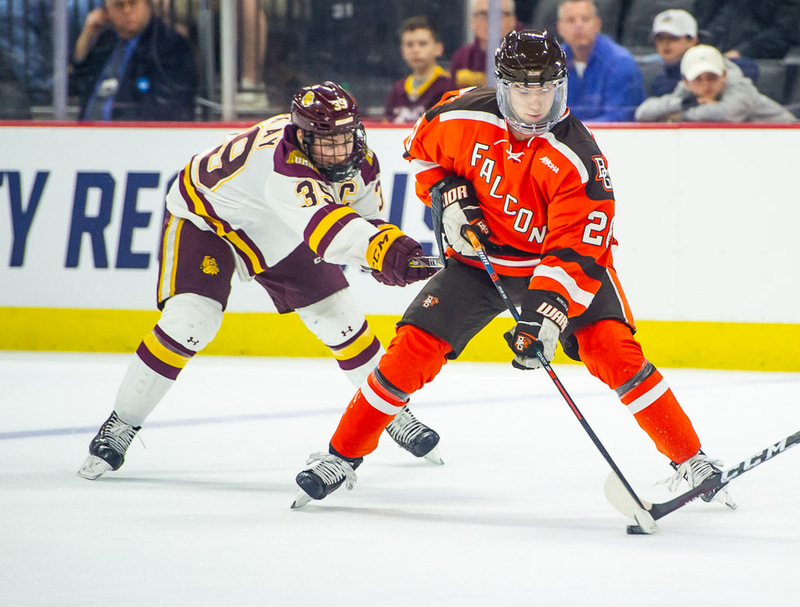 The Falcons finally broke the scoreless tie at 16:23 of the second period. 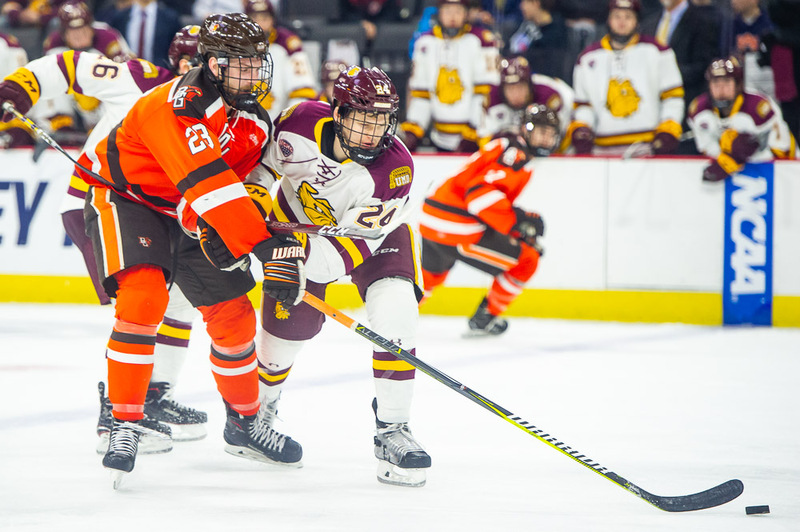 After forcing a turnover just outside the Bulldogs’ zone, Lukas Craggs fed the puck forward to Max Johnson to start a three-on-two zone entry. 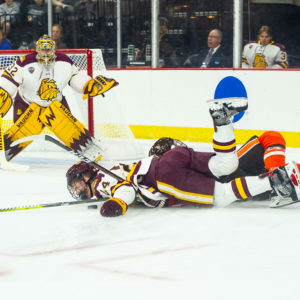 Johnson fell down but managed to get the puck over to Brandon Kruse. 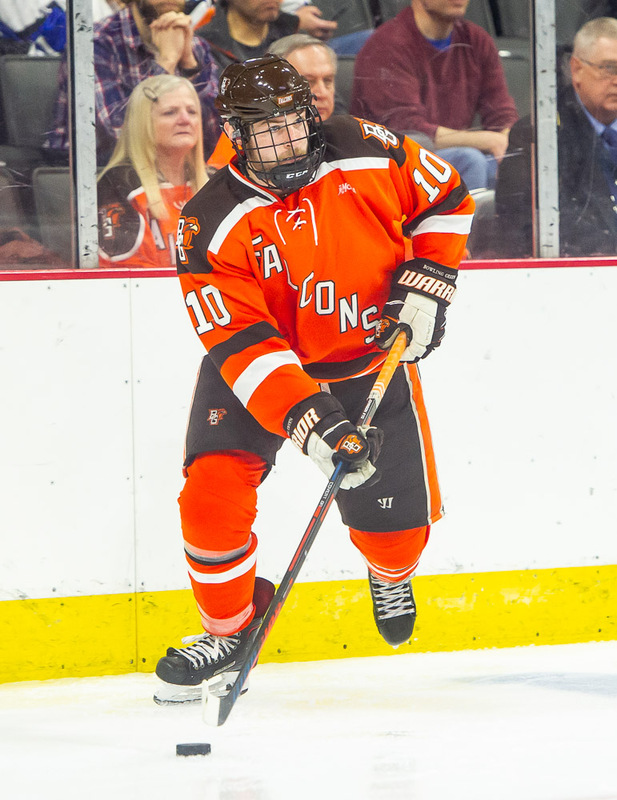 The Falcons’ offensive leader buried the shot for his tenth goal of the season. 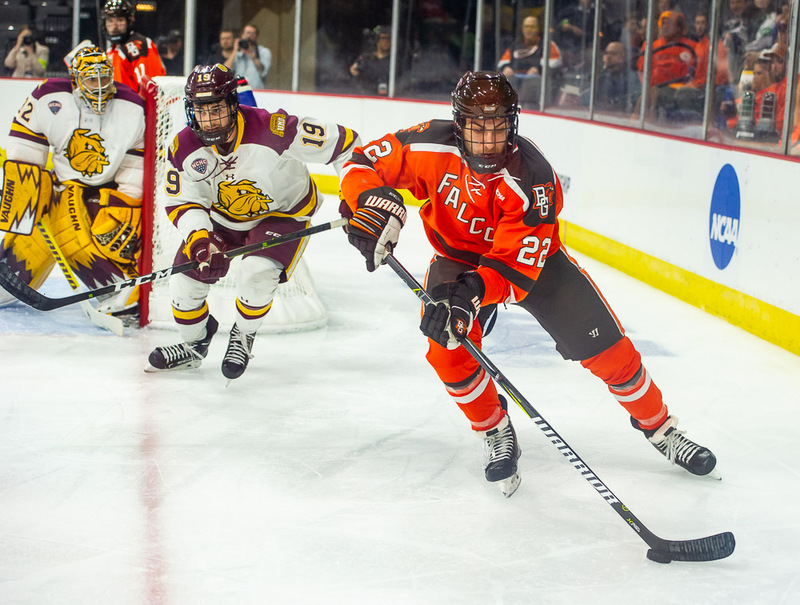 The Bulldogs had 10 shots in the middle frame while the Falcons had eight chances. 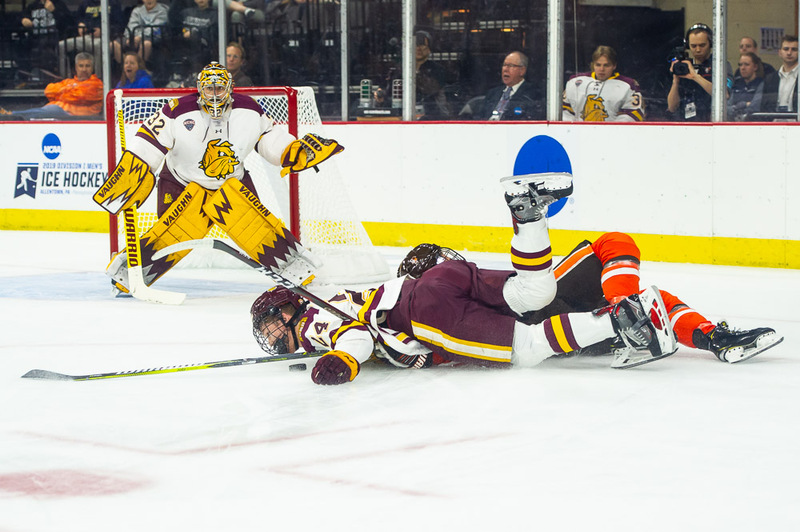 The Bulldogs finally found the net at 16:59 of the third period. 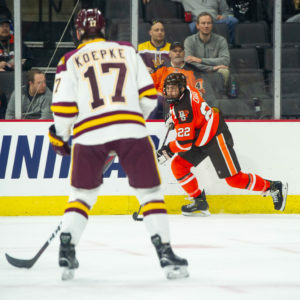 Cole Koepke wristed a shot on net that struck Parker Mackay in the shoulder. 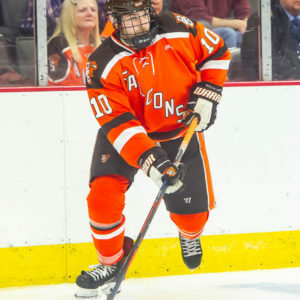 The puck bounced off Bednard, trickling in behind him to tie the game at 1-1. 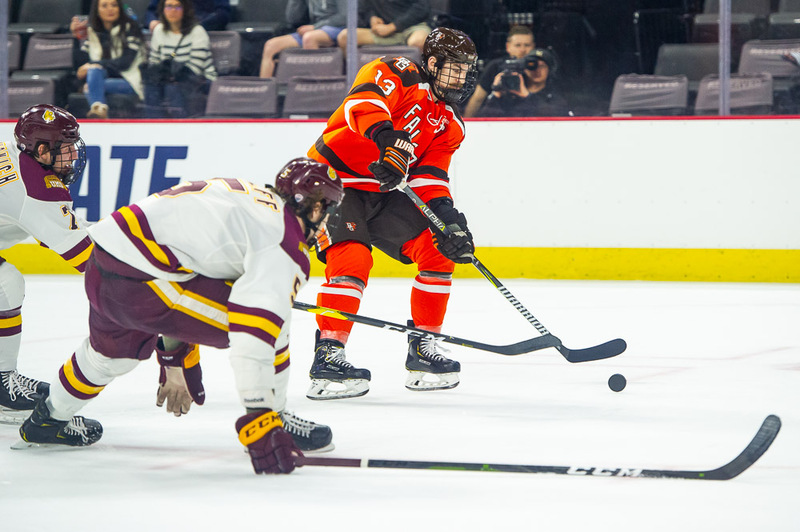 Neither team found the net in the third period, sending the contest into an overtime period. 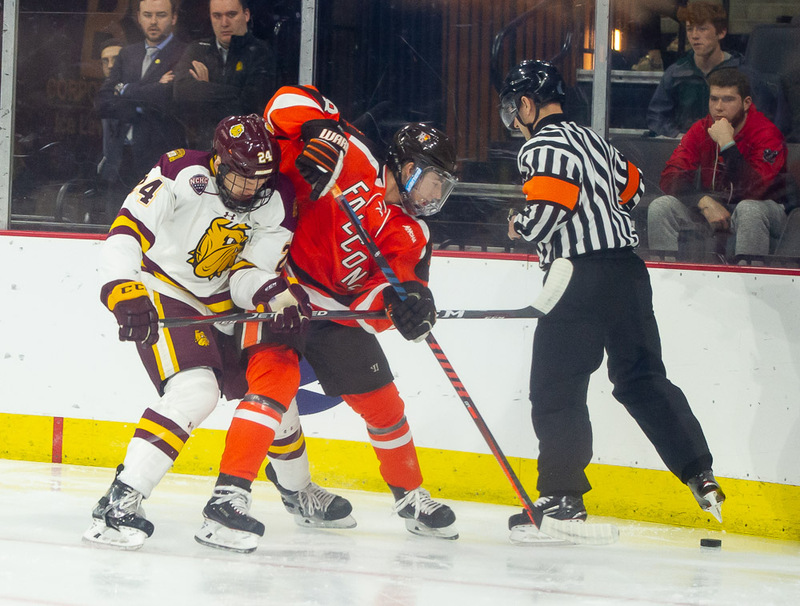 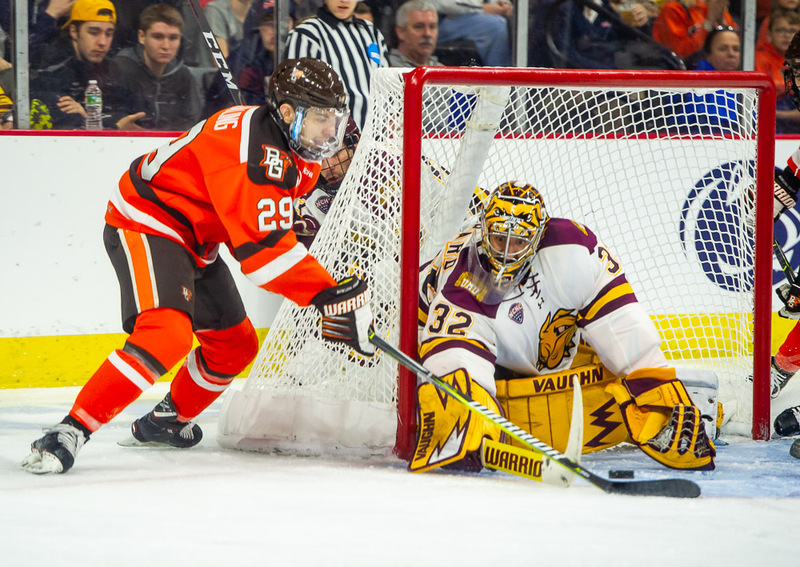 Minnesota Duluth had 14 shots in the third period while Bowling Green had eight chances. 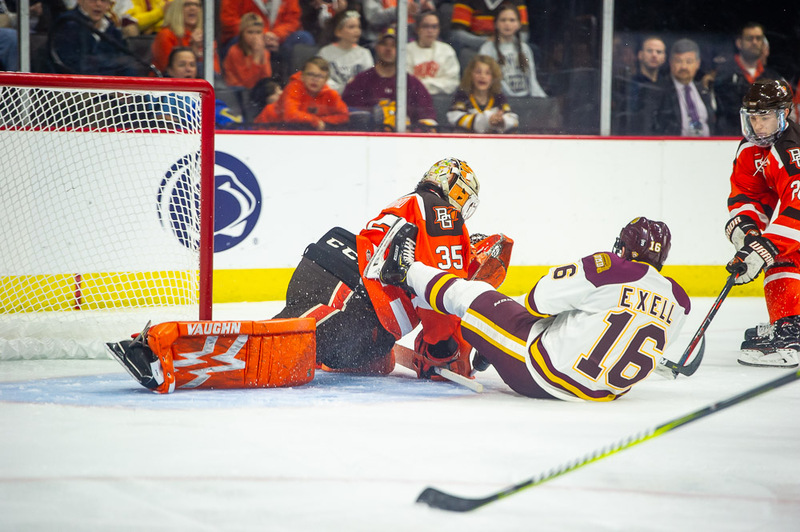 Parker Mackay picked up his second goal of the night with the game-winner at 11:45 of overtime. 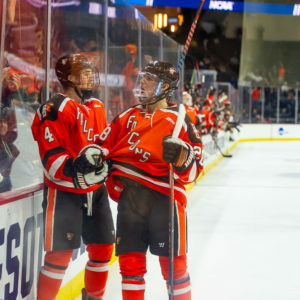 Bednard caught a piece of the shot, but not enough as it fluttered into the net. 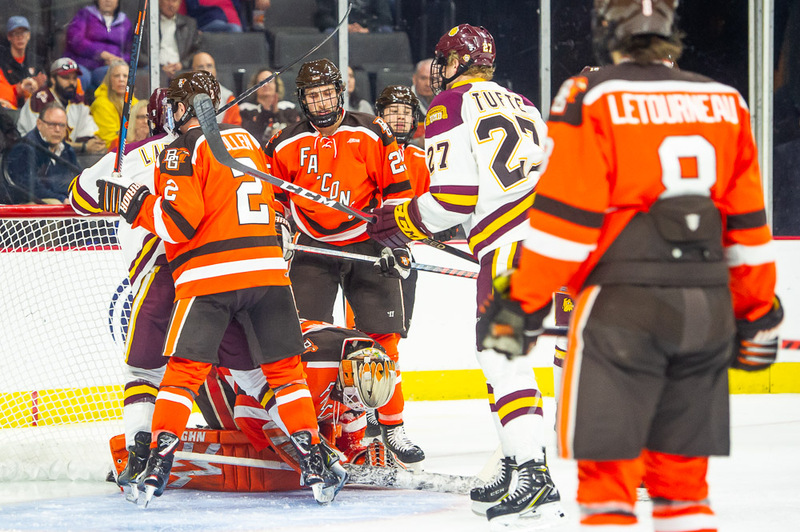 The Bulldogs had seven shots in the overtime period while the Falcons had five chances. 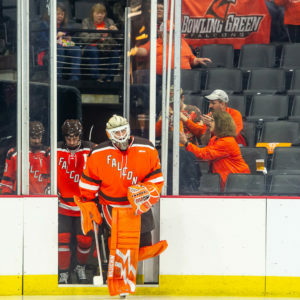 With the loss, the Falcons’ season ends with a 25-11-5, 16-8-4-3 record. 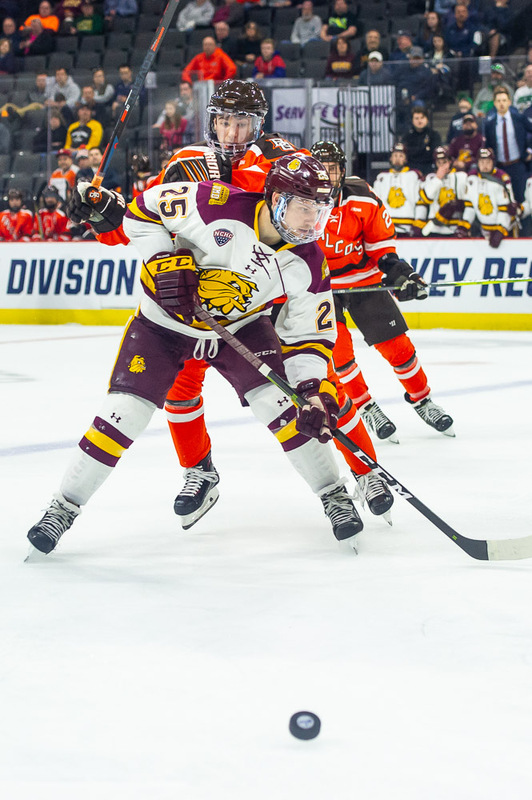 The Bulldogs improve to 26-11-2, 14-9-1-0 and will face the winner of Quinnipiac/Arizona State in the regional final.